SPLOST revenues increased only $4,686 for the September distribution (August sales) over the disbursement from a month earlier (for July). That is just less than 1 percent growth rate. The county has projected that SPLOST 2015, which voters will have a chance to express their views on starting at 8 a.m. tomorrow, will bring in $55.6 million in revenue, but it will take much stronger quarterly growth to reach that figure. Early voting will be Monday through Friday from Oct. 13 to Oct. 31 in the office of the Board of Elections and Registration, 10 Court Street, next door to the courthouse in Watkinsville. That office is open from 8 a.m. to 5 p.m. In addition, early voting will be held from Oct. 27 to Oct. 31 at the Oconee County Civic Center, 2661 Hog Mountain Road. That facility also will be open from 8 a.m. to 5 p.m. Early voting also will be possible from 9 a.m. to 4 p.m. on Saturday, Oct. 25, at the Board of Elections and Registration office. In addition to the SPLOST referendum, voters will decide if they want to allow for the sale of liquor by the drink in restaurants in the county’s four cities and throughout the county. No contests remain for local offices, since the Democratic Party did not nominate candidates. Statewide contests will be on the ballot, including the hotly contested races for the open U.S. Senate seat and for governor. The September SPLOST distributions were released by the state Department of Revenue at the end of last month. 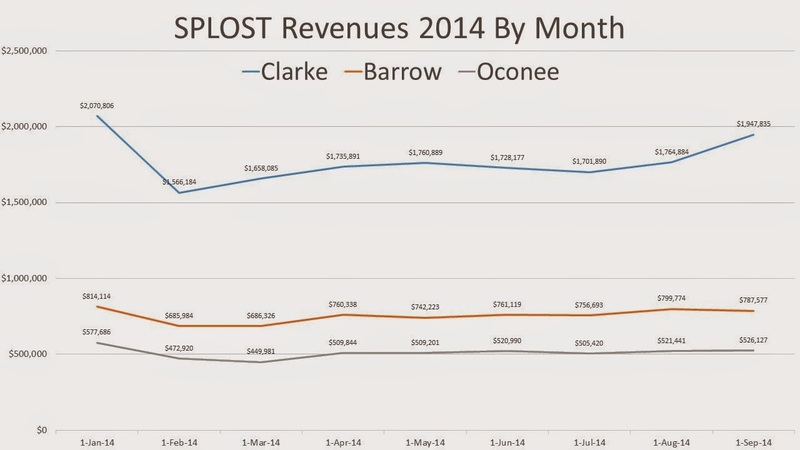 The chart below shows those revenues since the beginning of the year for Oconee County as well as for Barrow and Clarke counties. The three counties share the commercial corridor from Atlanta to Athens. Clarke County experienced strong tax growth in the last two months, compared with the growth in the other two counties. University of Georgia students returned in those months, and those students can shop in all three counties. The SPLOST tax for the three counties is the same. Quarterly figures smooth out the monthly variations. The rate of growth in Clarke County from the second to the third quarter was 3.5 percent, as it was in Barrow County. In Oconee County, it was 0.8 percent. To reach the $55.6 million projected revenue for SPLOST 2015, the county will need compounded quarterly growth of about 1.5 percent. Predicting state tax revenue is a very complex process, and states quite often get the estimates wrong, a study released last month by the Rockefeller Institute of Government of the State University of New York shows. Projections of revenue more than a year in advance are particularly likely to be wrong, the report states. State law requires the counties to make the long-range projection as part of the SPLOST referendum. The county has released no details of how it has reached the estimate of $55.6 million in revenue for the 2015 SPLOST that will appear in the ballot language. The current SPLOST is producing only about 80 percent of the projected $40.4 million in revenue. Because of the current SPLOST shortfall, the county has decided to move money around within the SPLOST categories, funding some of the projects listed in the current SPLOST at higher rates than others.